Yearning for more humanity in business? Wish you could work from your heart and make a bigger impact in the world? Then Conscious Leadership might be for you. It connects business and profits with purpose and doing good — inside and outside the organization. Here conscious means being aware: of a higher purpose, the environment, the present, and your own deeper self. Conscious leaders recognize that the old ways of power, control, greed, and disconnectedness won't get us far anymore. Success is being redefined. For our sanity and that of our planet. As conscious leaders we know that we are happiest and can be and give our best when we're not working in an environment of fear and power plays. We dare to release control and open ourselves up to trust and synchronicity, experiencing the world around us with a new level of curiosity, compassion, and spirituality. Conscious Leadership is a way of living. It is not something you turn on when you step into the office and turn off when you leave it. It's always on. It's the passion that can bring well-being and life-changing progress and growth to many, not only the few. Let's face it: too often people work at places that promise to improve the lives of others, i.e. their customers, but little thought or care is given to improving the lives of those that work there. The belief is that getting paid, receiving some healthcare benefits, and having a ping-pong table is enough. As a conscious leader, you know it's not. You see organizations as ecosystems. You understand that if people are not well, the organization cannot be well either. If people don't know their own strengths and weaknesses, neither can the organization know its own. If people don't know what they're doing and why, neither will the organization. Yes, it takes courage to become a conscious company. It implies stepping onto a different path, one that not only focuses and relies on business logic. One that requires heart and soul. It's a path filled with new doors that need to be opened. These doors are all about the quadruple bottom line of people, purpose, planet, and prosperity. No longer is it just about the other 2 Ps of selling a product and making a profit for shareholders, and you love that. You're ready to lift your team up to a new level of empathy and collaboration. Conscious Leadership is strength: the kind that grows self-efficacy, agility, and resilience. We understand not only ourselves better but also what's happening around us and what opportunities and challenges can arise from it. In the end, this isn't a management system: it is a shift in mindset and a movement of interconnected values and practices, such as mindfulness, Servant Leadership, Theory U, Design Thinking, and Agile. And it's already everywhere: organizations that are using Conscious Leadership concepts to thrive can be found across industries and include companies of all sizes, such as Patagonia, Buffer, Eileen Fisher, and Weleda. So ask yourself: Do I want to bring more humanity, agility, and creativity into my business? If your answer is yes, let's connect. 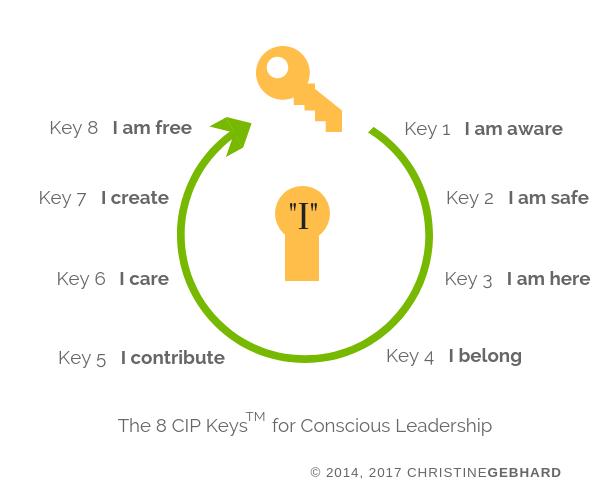 Before you go, let me share one more thing with you that I'm very excited about: The 8 CIP Keys™ for Conscious Leadership. I created them to make the shift to a more conscious way of working and leading simpler and more natural for you. Everything I do integrates the keys in some way. Their cycle is more than a pyramid of needs: each key contains an evolving set of focal points that challenge old-world thinking, expand the potential of your idea and mission, and boost democracy in the organization. CIP stands for conscious, inspiring, powerful. The eight keys are not a formula or tactics but straightforward and flexible pointers toward more fulfillment, well-being, and innovation at work. Have questions? I'd be happy to help: just say hi.